This article is about the Westwood game. For the Game Boy Advance version, see Eye of the Beholder (2002 video game). For other uses, see Eye of the Beholder. Eye of the Beholder is a role-playing video game for personal computers and video game consoles developed by Westwood Associates. It was published by Strategic Simulations, Inc. in 1991 for the DOS operating system and later ported to the Amiga, the Sega CD and the SNES. The Sega CD version features a soundtrack composed by Yuzo Koshiro. A port to the Atari Lynx handheld was developed by NuFX in 1993, but was not released. In 2002 the game was an adaptation of the same name was developed by Pronto Games for the Game Boy Advance. The game has two sequels, Eye of the Beholder II: The Legend of Darkmoon, released in 1991, and Eye of the Beholder III: Assault on Myth Drannor, released in 1993. The third game, however, was not developed by Westwood, which had been acquired by Virgin Interactive in 1992 and created the Lands of Lore series instead. The lords of the city of Waterdeep hire a team of adventurers to investigate an evil coming from beneath the city. The adventurers enter the city's sewer, but the entrance gets blocked by a collapse caused by Xanathar, the eponymous beholder. The team descends further beneath the city, going through Dwarf and Drow clans, to Xanathar's lair, where the final confrontation takes place. Once the eponymous beholder is killed, the player would be treated to a small blue window describing that the beholder was killed and that the adventurers returned to the surface where they were treated as heroes. Nothing else was mentioned in the ending and there were no accompanying graphics. This was changed in the later released Amiga version, which featured an animated ending. Eye of the Beholder featured a first-person perspective in a three-dimensional dungeon, very similar to the earlier Dungeon Master. The player controls four characters, initially, using a point-and-click interface to fight monsters. This can be increased to a maximum of six characters, by resurrecting one or more skeletons from dead non-player characters (NPC), or finding NPCs that are found throughout the dungeons. The possibility to increase the size of the player's party through the recruiting of NPCs was a tradition in all of the Eye of the Beholder series. It was also possible to import a party from Eye of the Beholder into The Legend of Darkmoon or from The Legend of Darkmoon into Assault on Myth Drannor; thus, a player could play through all three games with the same party. Eye of the Beholder was reviewed in 1991 in Dragon #171 by Hartley, Patricia, and Kirk Lesser in "The Role of Computers" column, who gave it 5 out of 5 stars. It was #1 on the Software Publishers Association's list of top MS-DOS games for April 1991, the last SSI D&D game to reach the rank. Dennis Owens of Computer Gaming World called it "a stunning, brilliantly graphic and agonizingly tricky" 3-D CRPG. The magazine stated that the game's VGA graphics and sound card audio finally gave IBM PC owners a Dungeon Master-like game. Scorpia, another reviewer for the magazine, was less positive. Although also praising the graphics and audio, stating that they "really give you the feeling of being in an actual dungeon", she criticized the awkward spell user interface and the "outrageous" abrupt ending. Other areas that needed work included the combat, plot, and NPC interaction; nonetheless, she was hopeful that with such improvements "the Legend series will become one of the leaders in the CRPG field". In 1993 Scorpia called the game "an impressive first effort that bodes well for the future". According to GameSpy in 2004, despite the issues in the first Eye of the Beholder, "most players found the game well worth the effort". CRPG Addict in 2015 gave it a 41 out of 100 score, six points lower than the score for Dungeon Master. He criticized the combat system and lack of in-game economy, but approved of the graphics, sound, user interface, and gameplay, concluding with "I enjoyed it ... It just wasn't as good as it could have been". Hailing the game as "a dream come true" for Dungeons & Dragons fans, Electronic Gaming Monthly gave the Super NES version a 6.2 out of 10, praising its 3-D graphics and variety of characters. They gave the Sega CD version a 7.2 out of 10, this time praising the ability to create custom characters but criticizing the audio. They also remarked that the game has a difficult learning curve. IGN ranked Eye of the Beholder No. 8 on their list of "The Top 11 Dungeons & Dragons Games of All Time" in 2014. Ian Williams of Paste rated the game #8 on his list of "The 10 Greatest Dungeons and Dragons Videogames" in 2015. 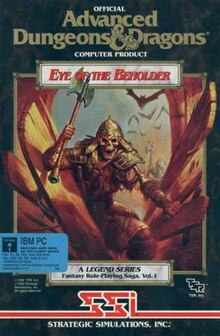 In 1991, PC Format placed Eye of the Beholder on its list of the 50 best computer games of all time. The editors called it a "classic romp through dungeons dealing with monsters, puzzles, traps and things mythical." SSI sold 129,234 copies of Eye of the Beholder. By mid 1991 over 150,000 copies had been sold worldwide. From February till October 1991, SSI started up a contest "Beholder Bonus", which required players to find a bonus feature (easter egg) in each level of the game, indicated by an onscreen message. The first 50 PC players and 50 Amiga players to discover all 12 features would win $100 worth prizes. There were two sequels: Eye of the Beholder II: The Legend of Darkmoon used a modified version of the first game's engine, added outdoor areas and greatly increased the amount of interaction the player had with their environment, along with substantially more 'roleplaying' aspects to the game. Eye of the Beholder III: Assault on Myth Drannor was not developed by Westwood, the developer of Eye of the Beholder and The Legend of Darkmoon, but rather in-house by the publisher SSI. Eye of the Beholder Trilogy (1995, SSI) was a rerelease of all the three games for DOS on CD-ROM. Interplay released the three games along with a number of other AD&D DOS Games in two collection CDs: The Forgotten Realms Archives (1997) and Gamefest: Forgotten Realms Classics (2001). Several modules for Neverwinter Nights (2002) have been created by fans as remakes of the original Eye of the Beholder game. A team of Indie game developers led by Andreas Larsson did a fan conversion of the game for the Commodore 64. ^ Petersen, Sandy (April 1994). "Eye of the Monitor" (PDF). Dragon. No. 204. TSR, Inc. p. 35. ^ "CES previews". QuestBusters. February 1991. p. 1. Retrieved 4 April 2016. ^ Barton, Matt (23 February 2007). "Part 2: The Golden Age (1985-1993)". The History of Computer Role-Playing Games. Gamasutra. Archived from the original on 30 March 2009. Retrieved 2009-03-26. ^ Atari Lynx Catalog. Atari. 1993. p. 2. ^ Owens, Dennis (June 1991). "Beauty is in the Eye of the Beholder". Computer Gaming World. p. 14. Retrieved 17 November 2013. This personalized combat perspective undoubtedly earned much of the praise for FTL's CGW Hall of Fame member, Dungeon Master. In a very real sense, Eye of the Beholder (SSI's first entry in the "Legend Series," a new line of AD&D computer role-playing games) is Dungeon Master meets veteran storyteller George MacDonald. ^ a b Lesser, Hartley; Lesser, Patricia; Lesser, Kirk (July 1991). "The Role of Computers". Dragon (171): 57–64. ^ "Computer and Video Games Issue 114" (27). May 1991: 28–29. Retrieved 18 January 2016. ^ a b c "Review Crew: Eye of the Beholder". Electronic Gaming Monthly (59). EGM Media, LLC. June 1994. pp. 33, 36. ^ Maher, Jimmy (31 March 2017). "Opening the Gold Box, Part 5: All That Glitters is Not Gold". The Digital Antiquarian. ^ Owens, Dennis (June 1991). "Beauty is in the Eye of the Beholder". Computer Gaming World. p. 14. Retrieved 17 November 2013. ^ Scorpia (June 1991). "Scorpion's View". Computer Gaming World. p. 51. Retrieved 17 November 2013. ^ Rausch, Allen; Lopez, Miguel (16 August 2004). "A History of D&D Video Games - Part II". Game Spy. ^ Bolingbroke, Chester (14 June 2015). "Eye of the Beholder: Final Rating". CRPG Addict. ^ Johnson, Leif (5 February 2014). "The Top 11 Dungeons & Dragons Games of All-Time". Retrieved 1 February 2018. ^ "The 10 Greatest Dungeons and Dragons Videogames". Pastemagazine.com. Retrieved 1 February 2018. ^ Staff (October 1991). "The 50 best games EVER!". PC Format. No. 1. pp. 109–111. ^ "Gold - The Mark of a Winner". Computer and Video Games. No. 117. EMAP. August 1991. p. 3. ^ "The Rumor Bag". Computer Gaming World. No. 79. Software Publishers Association. February 1991. p. 16. ^ "Scorpion News". Computer Gaming World. No. 87. Software Publishers Association. October 1991. p. 54. ^ "NWVault search for 'Eye of the beholder'". Archived from the original on 14 March 2012. Retrieved 8 March 2009. ^ Watamaniuk, Jay. "Neverwinter Nights: The Eye of the Beholder Project". Archived from the original on 31 March 2009. ^ "Eye of the Beholder - Work in progress C64". Indie Retro News. 16 June 2018. Retrieved 17 November 2012.